So you’ve discovered a wart somewhere on your body. Now what? After the initial groan and complaint that there’s something so invasive you’ve got to deal with, the next step is a treatment plan. But with so many, how do you pick one? There’s surgery, where a doctor will cut it out of your skin; cryotherapy, which is the process of freezing the wart to death; and even natural remedies like apple cider vinegar. Another option is a topical treatment. Coming in everything from creams to gels to ointments, these products use various medications to kill the wart over a period of time. 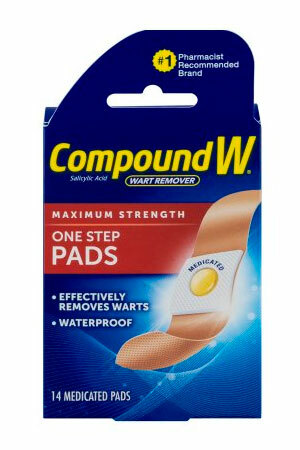 One such product is a wart patch, a highly convenient, over-the-counter product you can find anywhere. What Exactly Is A Wart Patch? Medicated patches have been used for years to treat various medical issues such as hormone therapy and pain relief. The specific medication is embedded inside the patch and slowly absorbs into the skin, delivering a slow, steady stream. They are left on for a specific amount of time and changed out for a new one until the therapy period is over. When it comes to wart patches, most use Salicylic acid as their main medication component. 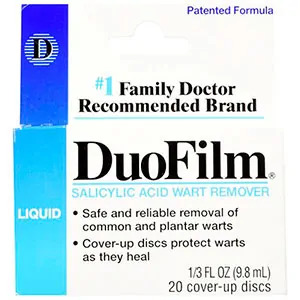 The acid is soaked into a special pad inside the patch and held tight against the wart, slowly delivering a constant stream of it to the wart tissue. They come in variations from a tightly sealed bandage to a more loose version of a band aid. 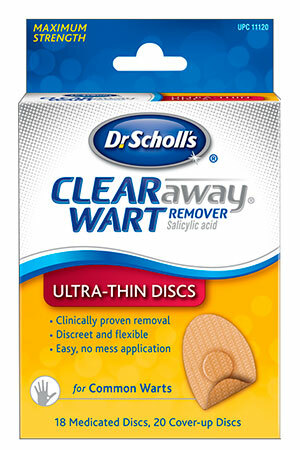 Do not treat genital warts with a wart patch. If you’ve got a wart on your hand, it may be more difficult to keep it steady during the day. Because of how much people use their hands, the patch can bend and twist much more than on other parts of your body, making the adhesive more unstable. Make sure you use a quality product that’s sure to stay put. You may also use first aid tape to hold the bandage in place more firmly. Remember that genital warts are treated differently than any other kind. One cream your doctor might prescribe for this condition is Aldara, otherwise known as Imiquimod. Find more information on Aldara cream for warts by going here. The good news is that wart patches can be found in most drugstores and grocery stores! You can find these wart patches almost anywhere. These pads are really just band aids with salicylic acid infused into it. Don’t use wart patches on regular skin that doesn’t have a wart on it. The salicylic acid used in the patches will burn healthy skin just like it will burn wart tissue. If you let it come into prolonged contact, it will leave behind a red and painful area or damaged skin that can lead to scarring. This product uses a clear bandage that forms a tight seal over the wart. The salicylic acid is held constantly in place, delivering the medication directly to the wart itself. These pads are infused with 40% salicylic acid. You’ll need some first aid tape or a band aid to make it stick, though, as there’s no adhesive on the pads at all. 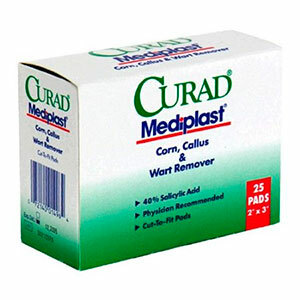 Click here for more information about mediplast wart remover. The salicylic acid in this product isn’t built into the pads themselves like regular wart patches. Instead, you brush the acid onto your wart, then stick the enclosed pads onto the site, where the patch will hold in the acid for maximum penetration. For a more detailed definition of salicylic acid for warts, click here. HPV is the virus behind all kinds of warts. Do you like the way a band aid feels as opposed to a fully adhesive patch? There’s several different brands that offer them for you to use on a wart, all using salicylic acid. Go here for more details on wart band aids. Having a plantar wart can be a different story than a common wart on your hand or face. Plantar warts are found on the bottom of your foot. The pressure from walking makes the wart flatten and widen outward, often creating a calloused surface to it as well. Because the skin is thicker than on other areas of your body, it can be harder for medication to get deep inside the wart and kill it. These wart patches have wart-fighting salicylic acid built into them, with a thick layer of padding to help aid any discomfort you might feel while walking. Warts often have black spots to them, also called “wart seeds.” These are actually coagulated blood vessels from the wart’s blood supply. They are harmless and will die off as the wart dies, and are a good way to tell if what you’re dealing with is truly a wart or something else entirely. 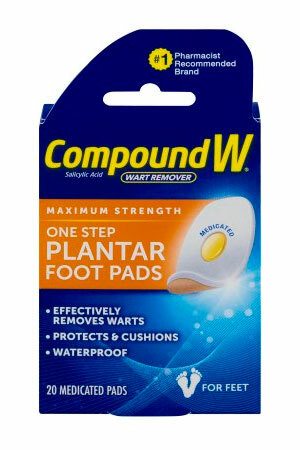 Also armed with salicylic acid, these pads offer full adhesive all the way around, cushioned to help with walking discomfort. Don’t want to use a cream or lotion? There are some medications, both natural and prescription, that you can take by mouth for warts that can boost your immune system, helping your body fight off the virus that causes the warts in the first place. For more details on oral medication for warts, click here. Derived from bark of the willow tree, salicylic acid burns off skin and wart tissue, layer by layer. When you brush it on your wart, it will penetrate into the topmost layers, killing the tissue before wearing off. You’ll do it twice a day, applying a new layer over the course of 2-4 weeks until the wart falls off. To maximize the effectiveness of the medication, soak your wart in warm water first, then file with a nail file or pumice stone to take off as much dead skin as possible before application. When you find a wart, research your options and consider using wart patches as treatment. 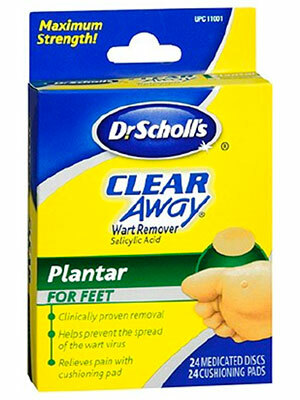 Not only are they easy and convenient, the killing power of salicylic acid works – you’re wart will be gone in no time!